NASA's Dawn spacecraft obtained this image on its approach to the protoplanet Vesta, the second-most massive object in the main asteroid belt. The image was obtained on June 20, 2011. A NASA spacecraft is right on target for its year-long orbital encounter with the huge asteroid Vesta, which is set to begin next month. NASA's Dawn probe is now just 96,000 miles (155,000 kilometers) from Vesta, the second-largest object in the main asteroid belt between Mars and Jupiter, NASA officials announced today (June 23). The spacecraft should enter into orbit around the 330-mile-wide (530 km) space rock on July 16. "The Dawn science campaign at Vesta will unveil a mysterious world, an object that can tell us much about the earliest formation of the planets and the solar system," W. James Adams, deputy director of NASA's Planetary Science Directorate, told reporters today. "To study this particular asteroid up-close and personal is a very unique opportunity." Dawn has been chasing Vesta for nearly four years. Since its launch in September 2007, the spacecraft has logged about 1.7 billion miles (2.7 billion km), researchers said. Dawn is now halfway through its final approach to Vesta and has been snapping photos of the space rock with its navigation camera. "Our destination is within sight, and this team is very excited that we're finally closing in on Vesta," said Robert Mase, Dawn project manager at NASA’s Jet Propulsion Laboratory (JPL) in Pasadena, Calif. The huge space rock's gravity will capture Dawn into orbit on July 16, when about 9,900 miles (16,000 km) separate the pair. At that point, the probe and the asteroid will both be about 117 million miles (188 million km) from Earth. Unlike many other spacecraft that go into orbit around other worlds, this capture won't require any dramatic maneuvers or last-minute burns, researchers said. Dawn has been using its low-thrust ion propulsion system to close in on Vesta's orbit slowly but surely, so it should slip nicely into orbit on July 16. Many researchers classify Vesta as a protoplanet. In the early days of the solar system, it was well on its way to becoming a full-fledged rocky planet — like Earth or Mars — before Jupiter's huge gravity stirred things up in the asteroid belt, preventing further growth, researchers said. "The surface of Vesta will hold a record of the earliest history of the solar system," said Dawn principal investigator Christopher Russell of UCLA. During its year at Vesta, Dawn will map the asteroid's surface in detail, characterize its topography and mineralogy and study its gravitational field. It will do this from several different orbits, ranging from 1,700 miles (2,700 km) above Vesta's cratered surface to just 120 miles (200 km). The information Dawn gathers should help scientists learn a great deal about Vesta's formation and geological history, researchers said. "The Dawn team is going to, over the next year, enable us to get a bird's-eye view of this new world. Until now, it's only been a fuzzy blob," Adams said. "The Dawn team will paint a face on that fuzzy blob." Dawn's work won't be done when it finishes its year at Vesta. In July 2012, it will depart the space rock and head to an even bigger body: the dwarf planet Ceres, the largest object in the asteroid belt. Dawn should arrive at the 605-mile-wide (974 km) Ceres in early 2015, researchers said. The spacecraft's observations will allow scientists to compare and contrast the two giant bodies, which have been shaped by different forces, researchers said. 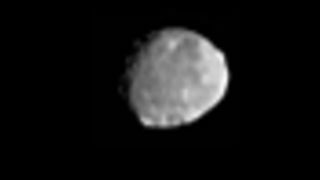 But for now, mission scientists are focusing on Vesta, which is just now starting to come into focus for the first time. "This is an unprecedented opportunity to spend a year at a body that we really know nothing about," said Carol Raymond, Dawn deputy principal investigator at JPL. "We're literally on the edge of our seats, waiting for this data to come in."